On Thursday, The New York Times delivered a big story saying that President Donald Trump overruled concerns from intelligence officials and ordered that his senior adviser Jared Kushner, who also happens to be his son-in-law, be granted security clearance. In some ways, the takeaway from the story is the least surprising part: There has been enough reporting over the past few months to make it seem plausible and even probable that this is what happened. The White House counsel at the time, Donald F. McGahn II, also wrote an internal memo outlining the concerns that had been raised about Mr. Kushner—including by the C.I.A.—and how Mr. McGahn had recommended that he not be given a top-secret clearance. Democrats on the House Oversight Committee tweeted that they had asked the administration whether the memos existed, and that White House staffers refused to say three times. This is only the latest example of people around Trump feeling compelled to document events that disturb them for posterity’s sake: Kelly, McGahn, the former FBI Director James Comey, the former Deputy Director Andrew McCabe, and the former fixer Michael Cohen have all done it. The president’s lieutenants keep being asked to do things and witness things that they feel are wrong, unwise, or even illegal, and they are making sure there’s a contemporary record to protect them from political blowback, legal exposure, or the president trying to throw them under the bus. That fear is not unfounded: Nearly everyone on this list has become a target of the president’s ire and attempts to shift blame. The first known example was Comey, who was the FBI director when Trump was elected. Immediately or shortly after several uncomfortable encounters with the new president, including incidents where Trump asked him for loyalty and asked him to drop an investigation into the ousted National Security Adviser Michael Flynn, Comey wrote memos to record the interactions. After he was fired, Comey gave the memos to the Columbia Law professor Dan Richman, who read them to reporters; the memos themselves later leaked. After Comey was fired, McCabe became the acting director, and he promptly adopted his predecessor’s approach. “I wrote memos about my interactions with President Trump for the same reason that Comey did: to have a contemporaneous record of conversations with a person who cannot be trusted,” McCabe later wrote. Of course, Comey and McCabe are different from the others: Neither of them was a Trump appointee, and Trump fired both of them, for reasons that range from legitimate to preposterous, depending on one’s interpretation. What is amazing is that Trump’s own appointees seem to have felt the same need to protect themselves. That includes Kelly and McGahn. This is not the only case of McGahn making sure there was a written record on a controversial or contentious subject, either. The Times previously reported that Trump sought to prosecute both Comey and his 2016 presidential rival, Hillary Clinton. McGahn reportedly tried to convince him out of it. “To underscore his point, Mr. McGahn had White House lawyers write a memo for Mr. Trump warning that if he asked law enforcement to investigate his rivals, he could face a range of consequences, including possible impeachment,” the Times reported. Nor is this phenomenon new. Michael Cohen, who worked with Trump for longer than any of these people, also sometimes recorded him, including a conversation about paying hush money to a woman who claimed she had a sexual affair with Trump. It’s not clear why Cohen chose to record that particular conversation. He told the House Oversight Committee on Wednesday that he’d made roughly 100 recordings over a 10-year span and added, “Sometimes I used the recordings for note taking instead of writing it down.” But the tape has come in handy, since it backs up his account of the hush-money payments, while Trump’s team has been forced to repeatedly change its version of events. Time and again, Trump has attacked former aides only to have their contemporaneous documentation back them up. Cohen has become a frequent target of the president, who has called him a “rat” and said he is not to be trusted. Cohen is in fact a convicted liar, who will soon report to prison to serve time for tax evasion, bank fraud, and lying to Congress. That makes the tape even more important, because it requires less faith in Cohen. Comey and Trump have been engaged in a dramatic he-said, he-said drama, but the fact that the former FBI director’s memos were written at the time of the conversations lends his version credence (as does Trump’s prolific lying). McCabe was fired for lying to investigators (which he claims was a pretense), but once again, his memos from the time hold more weight. Trump has not publicly attacked McGahn or Kelly in the same way, but he has tension with both men. 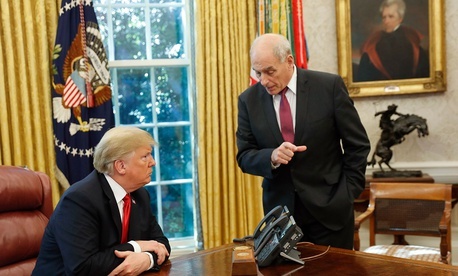 He and Kelly were reportedly barely on speaking terms by the time the chief of staff left the White House. Trump had become disgruntled with McGahn and publicly announced that the lawyer would be leaving before telling McGahn himself. In short, if aides are keeping these notes because they feel the president will turn on them or try to point fingers at them, they are not wrong. While the Comey, McCabe, and Cohen documentations are by now old news, the news about McGahn and Kelly opens up the question of how many other memos from the two men there might be, and what topics they could cover. It seems likely that Mueller would already have anything from McGahn’s shop related to the Russia probe—McGahn cooperated extensively with the special counsel—but there’s no telling what trove of revelations might exist for the rest of the American people.